#ThatBusinessShow welcomed Lubiana Plaushku, Manager of the Villa Bellini Restaurant, on the opening segment of today’s show. Located at 2930 Gulf to Bay Blvd in Clearwater, this restaurant features fine Italian cuisine and an extensive wine collection and bar. Newly renovated, Villa Bellini Restaurant & Lounge is proud to be located on a piece of property which has been in existence since 1929. The creative renovations that we have added, respectfully enhance the historical atmosphere of the building and create a warm and comfortable ambiance. Upon entering you will feel a “Taste of Italy in Clearwater”! Learn more at http://www.villabellinirestaurant.com and contact them today at 727-754-9848 for your next evening out or corporate event! Joining me in studio today was Expert Contributor and co-Host of today’s show, Jim McPeak. 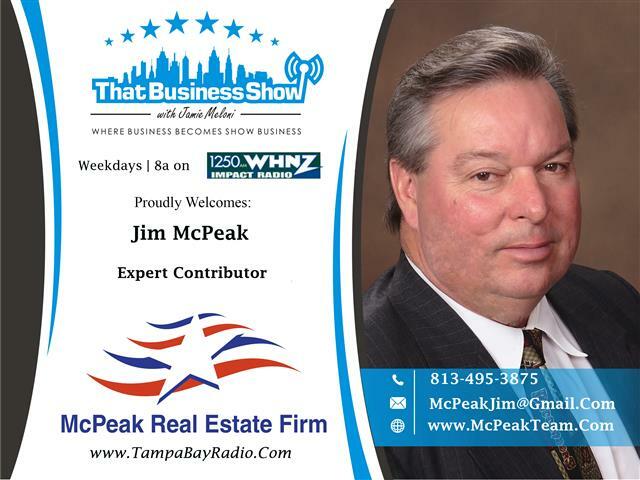 Jim is the owner of McPeak Real Estate Firm, and is a Real Estate professional like myself. His firm specializes in buyer representation and he lists and sells a number of bank owned properties as well. Jim is an Air Force Veteran and speaks of the advantages of USDA and VA loans on the 2nd segment and he and I touch on some of the ins and outs of bank owned properties. 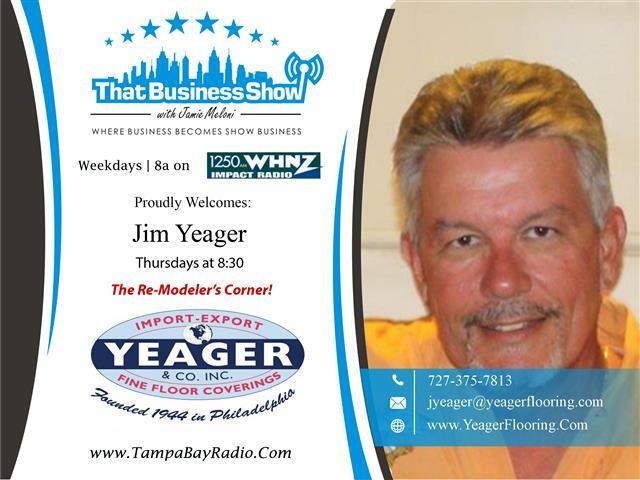 #AmericanPlumber, Charlie the Plumber also joined us in studio on behalf of Jim Yeager of Yeager and Company, a third generation flooring and remodeling company based in Odessa, Florida. Charlie always adds some passionate and opinionated color commentary to all the shows and this show was no different. 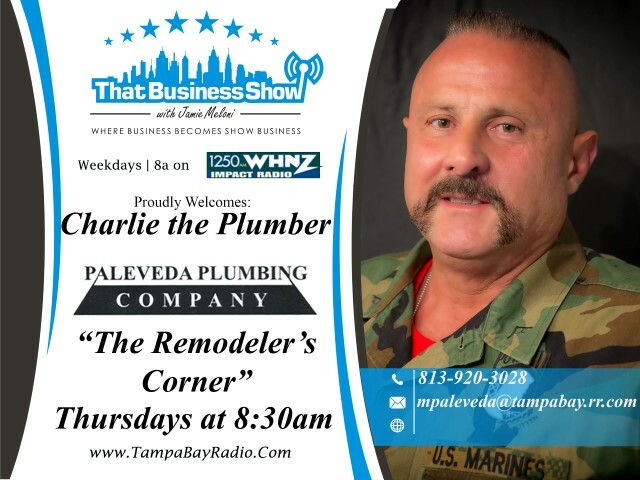 Charlie chimes in throughout the show and as always you can catch the full show at http://www.tampabayradio.com or on my YouTube channel at https://www.youtube.com/user/jamiemeloni and also on iTunes, just search for That Business Show with Jamie Meloni. Also, be sure to visit http://www.yeagerflooring.com for all your flooring and remodeling needs and tell Jim you heard about his company on the radio show for a discount on services. Phone is 813-918-2737. This entry was posted in Entrepreneurship and Business and tagged bank owned, business, entrepreneur, foreclosures, italian food, villa bellini. Bookmark the permalink. ← Show Recap – Healthy Living and St. Pete Wine and Food Festival with Dawna Stone and Craft Brewing with Leigh Harting!